Tough plants can take almost anything Mother Nature can dish out. 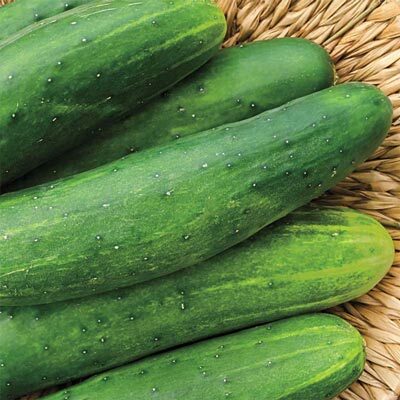 Long picking season means plenty of cucumbers and large yields. Dark green, cylindrical, 8-9" fruits are crisp and solid. Disease tolerance - resistance to CMV, ZYMV, WMV, Scab, Powdery Mildew, Downy Mildew. For each offer ordered, get 30 seeds per pkt..
Spacing: 4 feet between each hill. Depth: Sow seed 1/2 inch deep with 4-5 seeds per hill (thin to 2 plants per hill once it has emerged). Soil Requirements: Fertile, well-drained, sandy loamy soil; pH 7.0-7.8. Seed Count: Approximately 30 seeds per packet., 1/4 oz. is approximately 250 seeds. Fruit: Crisp, solid 8 - 9 inch fruits.